I am very happy with my moisturizer, but I've been wanting to add an oil to my night time skincare routine. I also had been on the lookout for a moisturizing primer to keep my foundation from sticking to any dry patches! I'm pretty happy with the products I chose, so if you're interested - keep reading below! 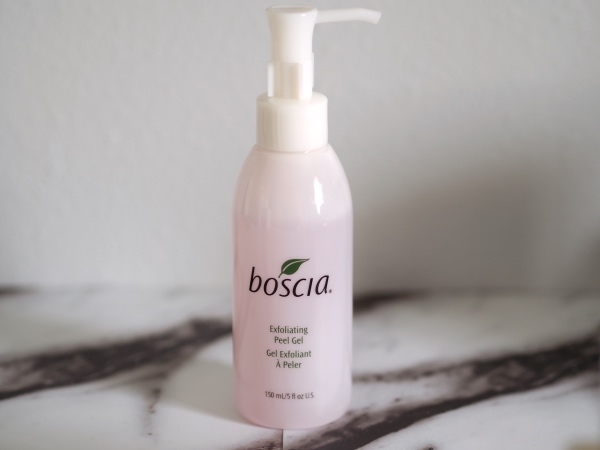 I mentioned this is my current skincare routine, but I am obsessed with exfoliating with this Boscia peel gel. I think the first, most important step to getting glowing, smooth skin is exfoliating. It basically gets rid of any built up dry skin and makes a clean base for any other skincare products you use. Because my skin is sensitive, I can't exfoliate with any harsh scrubs. I found this in Sephora last year and there really is nothing else like it. It has a gel texture and it chemically exfoliates your skin without over scrubbing or irritating. I absolutely love it and get much better results with this than any other scrub I've ever used, plus my face doesn't feel like I have brush burn! Win win. It's so important to moisturize your skin regularly, but especially after you exfoliate. Exfoliating helps the products you follow up with really sink in, so it's important that what goes on your skin next won't clog or irritate it. I found this Korres rose oil after a random search of the new arrivals at Sephora's website and Y'ALL, I am so glad I did. Rose is known for being good for sensitive skin, and this oil actually has rose petals in it, so you're really getting a good bang for your buck. It is also packed with Vitamin C, which helps to repair skin and keep it looking fresh and young. The oil is dry enough to sink in quickly and not feel wet all night, but definitely packs a huge hydrating punch! I apply this right after washing and exfoliate and follow it up with my tried and true Clinique moisturizer. The combination makes my skin feel calmed and baby smooth, even in the morning! After taking good care of my skin, I don't want to damage it with products that will dry it out or clog my pores. It's super important for me to have a hydrating primer and a foundation with SPF, because the sun is not my friend! I love First Aid Beauty as a brand as it is and I was totally sucked in by the name "Coconut Skin Smoothie." I mean, that just sounds delicious and hydrating! It has a strong smell, so if you're not into that then I'd avoid it, but I personally think it smells just like the beach and it really does keep my skin hydrated all day. My foundation used to gather around my nose and under my eyes, but with this is stays dewy, but not oily, all day long! I've heard so many people rave about It Cosmetics, but I'd just never actually picked anything by them up until now. I finally scooped up their color correcting foundation last month and I love it! The fact that it has SPF 50 really intrigued me, because that's very high for foundation, but also the anti-aging aspect, which means it is made to be very hydrating, but also fuller coverage - totally up my street! It looks very natural on my skin, stays all day, and doesn't dry my skin out. I wore it to a Mardi Gras parade and had a burnt scalp but no sun burn on my face, so I'd say that SPF really works! I think it will be great for the summer, because when applied lightly it almost looks like I have nothing on, just even skin! If you're looking for a few new products to add into your routine or want to get dewy, fresh skin just in time for summer, I highly recommend these products! I'm loving using them and find that they've made a big difference in the overall look and application/wear time of my makeup.